Luckily, I am able to pull some strings having been volunteer for 40 years. A word with the Loco Manager got the coach moved in the Christmas shunt to be accessible. Just on one end of a stored set rather than in the middle was what I hoped for, but Phil played a blinder with it spending Christmas and New Year on the centre road of the new Heritage Shed with diesel Moelwyn attached. A trip to Wales on the 30th December allowed me to start Moelwyn up and drag it out the shed for a full photo survey and to take some key measurements. I got most of it done outside but then it started to rain so I pushed it back inside whilst I did the interior shots. Another piece of luck was that Moelwyn behaved for me but when Phil tried to start it in Monday there was a flash, bang and a lot of smoke from what used to be a starter motor. I plan on writing some articles on the building of this coach and some observations about 3D printing, so I am only going to give an overview of the design and build for now. This model is 7mm/ft scale with a view to use on 16.5mm or 14mm gauge track. Quite a long time was then spent creating a 3D CAD model of Coach 102. I am fortunate to have SolidWorks as a CAD program which, whilst its got quite a steep learning curve, once you have mastered it the modelling is relatively straightforward. The temptation from both the 3D CAD model and the 3D printing is to do it all as one model as too many that is the simplistic view of 3D printing. The model is actually drawn as a lot of parts – think as if it was an Airfix kit – some are then joined together into Assemblies then printed and Assemblies joined to other Assemblies to present a view of the completed model and to check it all fits together. For example, the two body sides are mirrored copies except for the way the saloon door is hinged. One side was drawn with just a hole where the door goes, then mirrored to give the other side and then the doors added to both sides. One of the handy things the CAD allows is for you to view sections so you can see how stuff fits together. 3D printing is not the panacea some think it is. I am firmly in favour of the multimedia approach to modelling. Even within 3D printing there are many differing technologies – I have an FDM machine here that works by extruding molten plastic filament. It’s a handy tool to have but not for this job. All the 3D printed parts for this model were produced by the SLA process (UV cured resin) and here you come to another 3D printer conundrum. You have the major printing bureau with whom you tend to sacrifice fine detail and control for a lower price and the specialist who can do, or will at least have a go, when you are pushing the limits of the technology. The sides and ends of this model are slotted so that the glazing slides into the bodyside as illustrated by this picture showing black card in for the glass whilst the painting is being done. 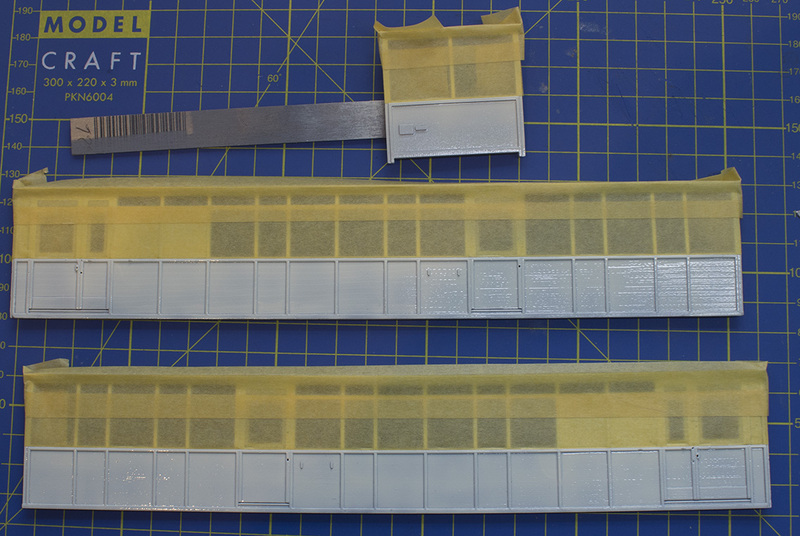 Other, less critical parts such as the roof, underframe and interior were done by a printing bureau. I had previously done a model of another FR coach with someone else’s CAD work and it had proved to be difficult to assemble holding the whole thing square whilst glued. I was afraid that the thin pillars at the observation end would make this one even harder and resolved to come up with a better plan. The corners were designed and printed with bevelled edges but then on the inside were printed blocks with holes through which a wire pin could be inserted. Think of a hinge with a removable pin. The blocks are both high and low so not visible and the pin is removed once the corners are glued and the underframe glued in. The picture illustrates this and it worked really well. It allowed a complete dry assembly as can be seen here with the interior temporarily in place. This is the interior as printed by the printing bureau. 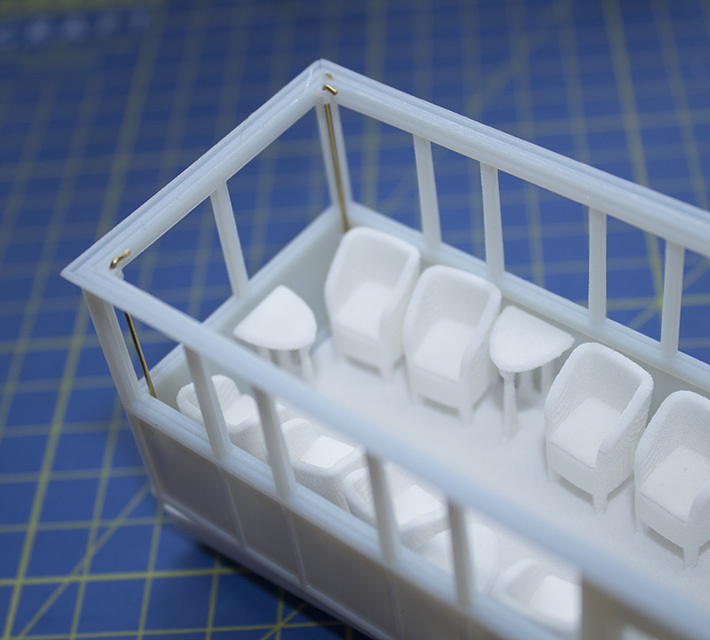 Initially I was disappointed as the wing backed arm chairs in the none observation saloon failed to print. Experience now tells me this was a good thing. Printing the Observation end chairs and tables seemed like a winner until I tried to paint them and they’re all so close together that painting is slow, messy and involves painting out the inevitable bits you got the wrong colour on. The high-backed chairs were done as another print and on a sprue making them easy to paint. Doing it again the Obs chairs would be a separate print. I did actually ask about getting the whole body printed in one print but the cost was astronomical as the print time was close to a week and at that point I hadn’t thought about how I would paint it. On the subject of painting the pinned assembly came up with another win. 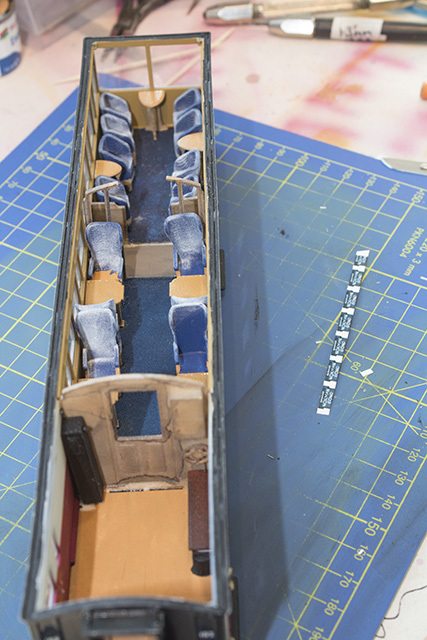 The sides and the observation end were painted in the flat prior to assembly which made masking and painting a lot simpler than doing the completed body. It was also quicker as they were done at the same time whilst I would probably have done one side, then the other and, finally, the end if working on the completed shell. I even went on to add the glass and the decals before assembling the shell. Glass! There was the start of a saga. 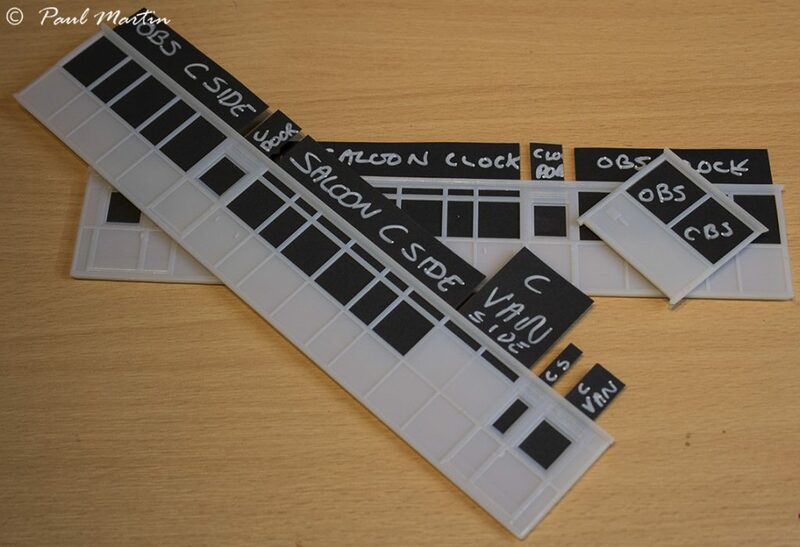 I had been unhappy with the bluey cast using plastic windows had in a previous model and I had read of using real glass in the form of microscope slide cover slips but I had never tried it. Luckily, they’re cheap as I broke a lot of them whilst I sorted my cutting technique. It is basically score and snap but getting to what the minimum score pressure is and still getting a clean break took some practice. 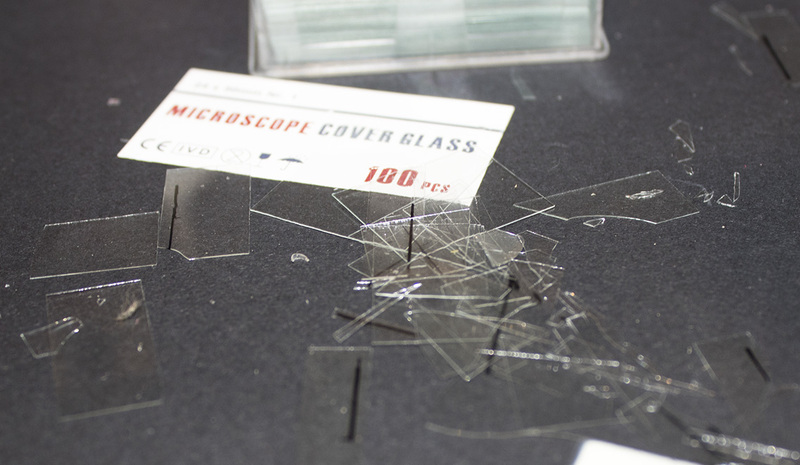 I know have about a 95% success rate for the first cut and happily the obs window depth is the same as a slide width. Where a second cut was needed my success rate is about 50%. I wonder if the first cut set up some stresses that the second releases by shattering? So, we get to final assembly. This is it with the interior all in just before the roof went on for keeps. In this instance the roof is glues on but I have already amended the design to make it clip fit next time. As this was a presentation model it has 3D printed scale bogies but they are rigidly fastened to the body which is in turn screwed to the plinth. What now? Would it make a kit? Well it might but here’s the rub, it’d cost about £250! Why, because there are no economies of scale with 3D printing. If I do the CAD artwork for a 3D print that is then cast in brass, or even etched material you pay a high initial cost for the CAD time, the 3D master or Etch photo tool but the casting or etches cost pence (or a few quid) per copy so the development cost is spread across all of them. With 3D printing if the cost of the first set of sides and ends is £100, then the second, third and one hundred and twenty third are also £100 a set. Finally, here is the model ready for presentation. Thank You. It’s 7mm/ft. I’ll amend the text as I should have thought to mention the scale. 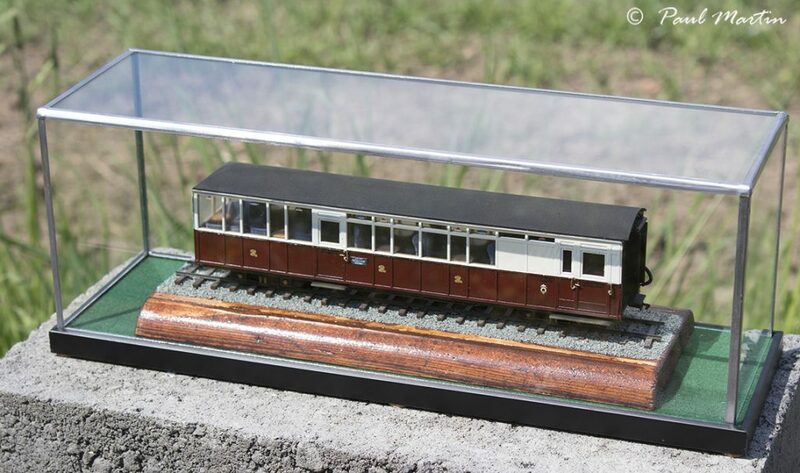 As soon as someone commissions a Welsh Highland set then I’ll model it. Not sure what the link with a traction engine is though?